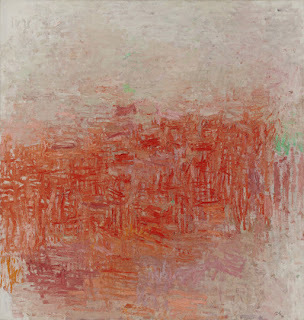 For a time, Philip Guston's work ran parallel to the abstract expressionists. He painted what some called abstract impressionism, taking the big gestures of Pollack and de Kooning and turning them in on themselves. Recently reissued by Calimari Press Scott Bradfield's The History of Luminous Motion reads as the impressionist book of post-modern hyper-realism, collapsing the psychological novel, the bildungsroman, the novel of ideas, the road novel and the meta-novel into one exquisite, heartbreaking and unsettling paradox. It probes into the problems of postmodernity with high lucidity and intelligence, but reads, nearly, as a standard narrative, using its lacunae to great effect. The novel begins with a Badlands-esque road trip, but instead of Kit and Holly, the two murderous lovers, we have Philip, our unreliable narrator, and his mother, a dazzling presence, equally unsettled and unsettling in her role as enabler. Taking the perspective of Philip's interior the book presents itself as the site of unsettled reality. Philip is presented as a precocious eight-year old psychotic. His intelligence and range are outside the standard domain of eight-year old precocity and he seems more a medium for the deeper essay of the author's play. Within the confines of literalism, Philip as an eight-year-old would be pursuing subjects equal to the emotional range of a thirty-year-old, let alone the intellectual range-- which isn't to say such a child couldn't exist, it's part of the book's undertaking to make it plausible if not immediately realistic. Counterposed to Padgett Powell's more genuine Simons Manigault in Edisto, where his intellectual precocity is shown to be limited only by the questions he can think to ask at his age, Philip's precocity reads as one of the places the author has given the reader to question the tenacity of its narrator, but also as a place to explore a sense of simultaneity. The specific type of simultaneity here is usually at play within memoir: the author's voice looking back and inflecting wisdom or giving form where there may not have been on his or her younger self. Parts of Philip may be autobiographical, but it is the quality of the thoughts and perceptions attributed to Philip that comes through as authentic. Philip is the agent that allows the author to pursue a limitless fictional universe, a place where that Dostoyeskian question (Is everything permissable?) can be explored. The paradox of the unreliable narrator is heightened here by the high lucidity and beauty of his voice. With Nabokov's Pale Fire, where a resolution of the meta-plot may be uncovered after following the novel's clues, The History of Luminous Motion seems more interested in allowing the facts of the plot to remain in question. The reality presented is Philip's, which may be all we ever get. The truth of the particular form of this character may or may not arise from biographical facts from within the author's own life. It is the interest required to make Philip's world elegant in its duality and the capacity to plumb a character that is this intellectually disturbing, as an avatar for moral and perceptual relativism, that makes the book. It is the sadness, imparted in unexpected ways, of Philip's condition, the inherent brokenness, that made this book human. A mediated tragedy, not tragedy as Sophocles would portray, but as felt in the passing wonder of distant lives. Published in 1989, two years before Brett Easton Ellis's American Psycho, five years before Stephen Wright's Going Native, and seven years before David Foster Wallace's Infinite Jest, this book prefigures and quietly implodes a number of tropes that would come to dominate the US media-scape in the 90's.